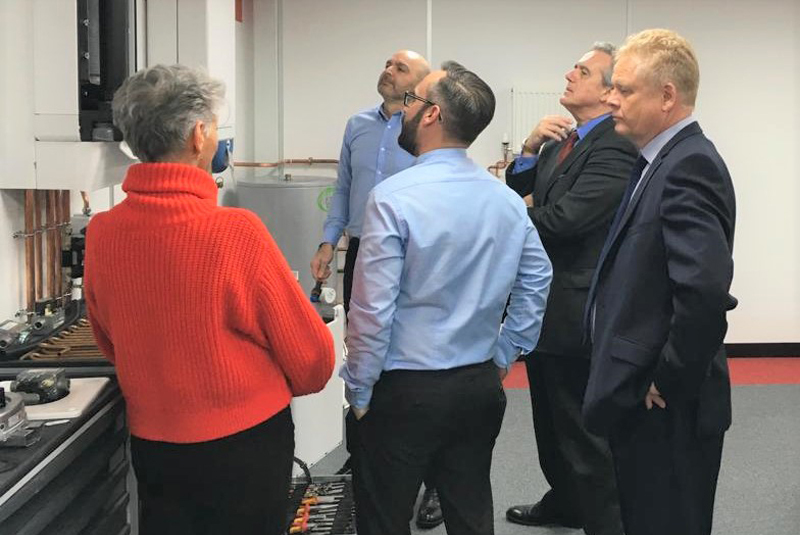 Intergas, which moved its UK head office from Kingswinford to larger premises on the Easter Park industrial estate in Kidderminster last year, has completed its renovation of its new state-of-the-art training centre and invited Mark Garnier, MP for Wyre Forest, to officially open the centre. Garnier’s visit followed on from the publication of a new report from the Committee on Climate Change, ‘UK housing: Fit for the future?’, that warns the UK’s legally-binding climate change targets will not be met without the near-complete elimination of greenhouse gas emissions reductions from our homes, and that our homes currently account for 14% of total UK emissions. While this may be seen as a sad indictment of energy efficiency measures, Intergas had positive news. The R&D team at its head office in Coevorden is reported to have created the lowest NOx boilers in the world, the Xtreme and the Xclusive, and both emit as little as 17.06mg/kWh. The Xtreme also has a built-in passive flue gas heat recovery unit to further reduce emissions of CO2. Both boiler models are available in the UK now. Next : WATCH: Snickers Floorlayers Trousers… TESTED!